Let our Experience & Results WORK for YOU! This case was declined in writing by one of the largest and most respected law firms in Chicago. Like we always tell our clients – EXPERIENCE & RESULTS matter and so should YOUR case! Attorney Jeff Tomczak of The Tomczak Law Group is featured on Oxygen Network’s true crime series television show – Snapped! **Show to be aired in January of 2015. Click the PLAY button below to hear attorney Jeff Tomczak on local radio! Over the last 25 years The Tomczak Law Group has been helping people and families in the trial courtrooms of Will, Du Page, Cook, Grundy, Kankakee and LaSalle counties of Illinois – handling the most serious, high profile personal injury, accident and criminal defense law matters. 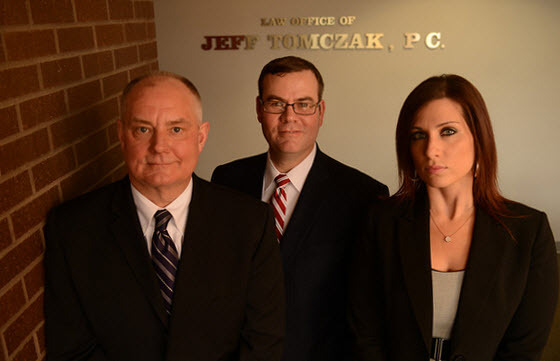 Since 1985 the Tomczak Law Group has handled several important and high-profile cases. If you hire a lawyer who never goes to trial, and does not have trial experience – you will not receive the compensation you deserve. The insurance companies know who the active courtroom trial lawyers are, and who they are not! What separates us from our competition is that we are respected by the insurance companies, the judges and other lawyers because of our reputation and RESULTS! Experience & Results MATTER and so should YOUR case! 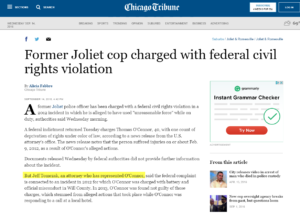 Attorney Jeff Tomczak in the news – will represent O’Connor in the federal case. How long has the lawyer been in practice? What percentage of the lawyer’s / law firms practice involves personal injury cases? Ask about past verdicts and cases. When was the last time the law firm / attorney had a COURTROOM TRIAL? If I am not happy with the settlement offer and you want to settle, will you go to court anyway? If I am happy with the settlement offer, but you think we can win more at trial, will you follow my wishes? Over 50 Years of Combined Courtroom Trial Experience Working For You! The Tomczak Law Group has a proven track record with experience in personal injury / accident law, criminal defense law, workers compensation / third party actions, motor vehicle accidents including; truck accidents, motorcycle accidents and car accidents, nursing home abuse and neglect, medical malpractice, products liability, premise liability / slip and fall, dog and animal bites, and civil rights. If you need the help of a personal injury, or skilled accident lawyer in Will County or Chicagoland – contact our firm. EXPERIENCE & RESULTS matter and so should YOUR case! Because of our past experience as a former State’s Attorney / Top Prosecutor – we understand the entire legal system from “both sides of the fence” (serving both in the public and private sector). We utilize this experience to better serve our clients. The bottom line – trial law is our passion. Our goal is simply to serve our clients and WIN cases! Let our Experience and Past Results WORK for YOU! We serve the entire Chicagoland area. Our main service area is Joliet, Plainfield, Bolingbrook, Crest Hill, Frankfort, Homer Glen, Lemont, Lockport, Mokena, Naperville, New Lenox, Orland Park, Romeoville, Shorewood, Symerton, Tinley Park, Wilmington, Morris, Beecher, Crete, Elwood, Godley, Manhattan, Monee, Peotone, Rockdale, Will County, Cook County, Du Page County, Grundy County, Kankakee County and LaSalle County including the surrounding towns, areas and communities. Contact The Tomczak Law Group at (815) 723-4400 or email us today to set up a meeting to discuss the specifics of your case. Experience and results MATTER and so should YOUR case!